This kind of post gets written on January 1st, typically. Y'all are probably reading the post title and thinking, "Did I miss something? This should've been posted four months ago!" Yes, I know it is April 16th. For a plethora of reasons of which I will spare you, I really am feeling four months behind in the world of 2016. My goals are still in progress, and I will be honest and tell you that I just started writing them down not too long ago. My energy, my vision, the fuel that lights my fire...that all didn't kick in until last month. I've just been behind on life this year. I'm telling you, those were some glorious days! First of all, I'm so thankful God knows the timeline of our lives and that He runs it, not us! As always, He knew just what I would need on the exact day. He knew that I would need those three days that I had off at one of my favorite spots ever. He knew that that time would be the perfect time, in which I would be ready and have quiet and rest and TIME to plan and dream and scheme and prepare. HE KNEW. I haven't written on the blog here (as in, REALLY written) for a very long time. In fact, I think that the only "contemplations" style posts (or more like, fireworks style maybe!) this year have been political posts. It's not that I haven't been writing at all on heart stuff. My pen and keypad have been on a roll lately. I was pretty dried up in January + February and honestly had the thought more than once about deleting this whole blog. (I'm serious) But then in March God just really got me back on the straight + narrow and gave me a distinct vision for what He has next for me. And, like I said, my pen and keypad have been on a roll. I just haven't had peace in posting much of it until now. I have literally dozens of post ideas written down, and about twenty articles saved in my drafts folder. So y'all can pray that I will post them whenever God gives me the green light + final thoughts for each one! Things will be pretty sporadic still for the next two months as I am focusing on some relationships + personal goals + also working on changing things here on the blog. (think new look!) All good things take time, yes?! Jesus is doing great things in this world and my life. I'm just blown away again at how AWESOME it is to be on the Jesus team. I can't imagine life without Him-He has shown Himself SO STRONG in my life this year already and I'm beyond grateful for the opportunity to lean on Him when my strength is weak. There's this song that says, "life is hard but God is good" and I just couldn't agree more. I'm especially blown away by how He can take the darkest seasons of our lives and make something beautiful come out of it. Painful, yes. Undesired, yes. Messy, yes. But still beautiful. The header picture for this post was taken on our road, last fall, just before harvest. It goes perfectly with my title today because it is a picture of the sunrise, which always signifies a clean slate to me. 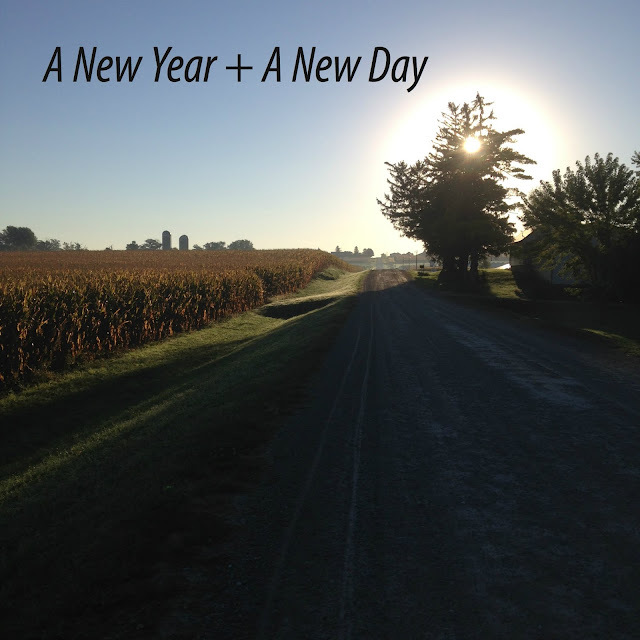 As Anne Shirley would say, "it's a new day, with no mistakes in it". That's the thought I'm taking for the coming year, or the two-thirds that remains of it. Jesus has a purpose and He ALWAYS gives vision + direction when we seek Him for it. I'm excited about what He has given me. And I have JOY in my heart because I know He always gives strength to carry out the vision He gives. And that is something to be excited about! Y'all have a gorgeous weekend + I'll see ya back here soon! You and I are in the same boat in SO many ways this year:) thanks SO much for this post. It encouraged me!!! Just because...that PHOTO!?! Chels, that is gorgeous!!! As for the post itself, praise God that He's given you some new visions/goals/dreams for this year-well, what remains of it:) Thank you for the reminders and encouragement, friend. Stay STRONG!!! If you'll go in Jesus' NAME"
Yes, I am attending Allison's retreat! Sistas in Christ are the best!! Are you lovely girls going? Glad I'm not the only one who feels four months behind on life too..oh man. the struggle is real.. #monkeyhandsovereyes Yes, the beauty after the ashes and how He makes everything work for good..so amazing. Love you and love your heart..keep shining, Chels. The beginning of this year has kinda been the same way for me, I had many goals and plans this winter, and ended up accomplishing zero of them. But already now as I look back I am so thankful God brought me through it, I grew so much in my faith! I love your blog and what you stand for. that is so wonderfull the lord has given you new goals and visions!! Praise the lord!! I just read this post tonight. I know you will be in prayer for all of what you wrote about here. The service tonight convicted me. I thought I knew what I wanted but in reality, I know nothing of what is best for me. I've surrendered all. I am broken and I need Jesus. I thought a new job would bring new avenues. It has only brought up what was bad before I found my way back. I didn't listen to that still small voice. I need prayer and I am praying. I know God has a plan, even if it makes absolutely no sense to me now.